The case for precious metal coinage as the best form of money arises from two things: first, an understanding of how money developed in the past; second, an understanding of economic theory. The case for a precious metals coinage is the case for historical continuity. Individuals in the past voluntarily adopted gold and silver coins as the preferred commodities to facilitate economic exchange. They did not accept these two metals as the preferred monetary units because of their commitment to economic theory. They chose those metals because there are advantages offered by these metals that competing commodities do not possess to the same degree. The main advantage is continuity of value (price) over time. Gold and silver became currencies throughout the world because they possess certain physical characteristics that facilitate their adoption as money. The most important aspect of both gold and silver is that they must be mined. It is expensive to dig these metals out of the ground. Silver is primarily a byproduct of the mining of other metals: lead, copper, and zinc. Mining firms must bear the costs of extracting these metals from the earth. This limits the production of these metals. They are comparatively scarce minerals, and it is expensive to dig them out of the ground. So, not much gold and silver come into the economy in any given year. Because the two metals became desirable in the past primarily as monetary commodities, there is considerable demand from individuals to own these commodities whenever they become money. This is the issue of continuity over time. They were valuable in the past, so people expect them to be valuable in the future. People pay to purchase these commodities with the net output of their productivity. They bid for ownership of these coins just as they bid for ownership of any other commodity. They offer their goods and services for sale in exchange for gold or silver. There is continuing demand for these metals. This encourages miners to search for better ways of discovering and refining gold and silver. The supply of money increases slowly and predictably. People can adjust their plans accordingly. Because of the geological limitations on the production of gold and silver, individuals can more accurately predict price changes. If they are not good at forecasting, profit-seeking specialists will do this on behalf of consumers. Specialists in forecasting have knowledge of the available supply of particular goods and services. They can rely on the fact that there will not be an extensive increase in the supply of gold or silver, precisely because it is so expensive to dig the two metals out of the ground. So, this creates an environment in which individuals can make fairly accurate forecasts about the production costs of whatever it is they produce. The focus of concern for a forecaster is more on the supply of the nonmonetary side of any transaction than on the monetary side. The monetary side is stable. This increases predictability. This in turn decreases the likelihood of errors in forecasting. By reducing the likelihood of errors, everyone benefits. This assumes that the state does not control the supply of money. If the state controls the supply of money, which means fiat money, then the predictability of prices is reduced. The supply factor of money becomes far more variable. Pricing therefore becomes far less predictable. This increases the cost of doing business. People have to invest resources to protect themselves from errors in their forecasts. In other words, they must buy some form of insurance. If the state were not in control of the money supply, individuals would not have to set aside as many assets to protect themselves against variations in the money supply. Gold and silver have been universally recognized by societies throughout the world as reliable forms of money. This has given an advantage to any society that restricted the use of money to gold and silver coins, or warehouse receipts to specific quantities of gold and silver. This is what the 19th century provided more than any society in modern times. Historically, the only society that has maintained a gold coin standard for 1000 years was Byzantine society, from the fourth century until the 15th century. That was the longest period of monetary stability in the history of man. Eastern Rome was wealthier than Western Rome, and the most important single reason for this was the fact that Eastern Rome had a stable monetary order for 1000 years. Deflation of the money supply is unlikely under gold and silver monetary standards. Most gold stays above ground and is in somebody's possession. This is less true of silver, which is more of an industrial commodity than gold is. But deflation as a policy is highly unlikely. There can be no vast increase of the money supply, because gold and silver are difficult to mine. There is therefore no subsequent monetary contraction, because individual gold and silver coins are held by individuals across the world. No society can vastly expand the quantity of gold and silver, and therefore we cannot have an economic collapse that is based on the breakdown of exchange because of the contraction of money. When gold and silver coins are the primary form of money, increases the production of nonmonetary assets tends to lower prices. There is a steady increase in the output of goods and services other than money, and therefore we have a situation in which more goods and services are chasing essentially the same quantity of money. This leads to steadily lower prices. Steadily lower prices are the correct economic goal. Whenever we view scarcity as a liability, then the increase in productivity steadily reduces the effect of this liability. If we want to see a decrease in scarcity, we want to see a decrease in the general price level. As greater productivity enters the society, the competition among sellers of goods and services in order to gain ownership of gold and silver will lead to a reduction of prices. This is the whole point of competition. We want to see lower prices. Lower prices are an indication of increased wealth. So, deflation, in the sense of price deflation, is a social benefit and an individual benefit. Deflation in the sense of the contraction of the money supply is not a social benefit and not an individual benefit. Gold and silver produce the kind of price deflation that is good for individuals as well as social order. Fiat money produces the kind of economic crisis and monetary contraction that is bad for individuals and social order. Those few economists who defend the use of gold and silver coins as the basis of the monetary system are dismissed as gold bugs. The reason why they are dismissed is that their opponents believe that the government should be sovereign over money, and that politicians and bureaucrats are the proper sources of economic policy. These critics of gold do not trust the free-market social order. They do not trust individual decision-making. They especially do not trust individual decision-making with respect to how much money an individual should possess. They have a fundamental hostility to individual responsibility, and this is manifested most obviously in their hostility to gold and silver coinage as the foundation of the monetary order. They dismiss what they call the theology of gold. They dismiss it because they are great believers in the theology of state sovereignty. As high priests of civil government, they are contemptuous of defenders of individual responsibility regarding the quantity, quality, and physical form of the monetary unit. So, it is never a question of the theology of gold. It is always a question of whose theology of gold: pro-gold or anti-gold. In the 20th century, the theologians of fiat money have predominated over the theologians of gold and silver coinage. This is another way of saying that the theology of state sovereignty has predominated over the theology of the free market. There are certain features of the original commodities that have become money historically. These features gave the original money metals an advantage over all of the other commodities that might have served as money, and in some cases historically have served as money. There are five of these characteristics: recognizability, divisibility, portability, high value in relation to weight and volume, and continuity of value over time. Any physical commodity that possesses these five characteristics is a candidate to become the monetary commodity of a particular social order. All forms of money are marked by one characteristic above all other characteristics: liquidity. It is unfortunate that economists use the term "liquidity" to describe such an asset. This is a transfer of a physical characteristic to an economic characteristic. There are three characteristic features of a liquid asset. First, you can get other people to exchange goods and services for this commodity on what is essentially an instant basis. Second, you can persuade them to make the exchange without offering a discount. Third, you do not have to spend any money to advertise the item to persuade other people to exchange their goods and services. These three features must be present in order for commodity to attain the status of money. I will give an example. If I walk in to a store, pull out a dozen $100 bills, and ask, "Can I get anyone help me?" I will get someone to help me. I will not have to ask this twice. This may be a socially disapproved public display, but I will get help. If the salespeople are working on commission, I will get lots of help. I don't have to offer extra money to get the salesperson to sell me whatever that is offered for sale. I may even be offered a discount if I am willing to buy more than one costly item. Third, the advertising procedure is really simple. I just say, "I've got his money here. Does somebody want to help me?" That is all the advertising I need. Any item that cannot be exchanged for goods and services on this basis is not money. Somebody may want to call it money, but it is not money. In today's world, gold is not money. I cannot go into Wal-Mart and buy whatever I want for gold coins. Wal-Mart's barcode system is not set up to recognize gold coins. The promoters of fiat money have been ingenious in finding ways to de-monetize gold. It was done in the United States by Franklin Roosevelt in 1933. He made it illegal for Americans or residents of the United States to own gold, either in the United States or outside its jurisdiction. That de-monetized gold. That made gold a nonmonetary commodity. Gold bugs may proclaim: "Gold is money." Gold is not money except for central banks. The legal order of the United States and every other nation ought to be restructured so that the voluntary ownership of property can lead to the decision by individuals to hold one form of money or another. If they choose to hold gold or silver coins, then these should be a society's money. Gold should not become money because of a decree by civil government. In the same sense that gold should not have been de-monetized by a decree of civil government, gold should not be re-monetized by civil government, except in one limited case. If a government is going to tell people that it will collect taxes, it has the legal authority to designate what the tax unit of account will be. I recommend that governments designate the unit of account for taxes as gold. That is the extent of what government should do to promote gold. Gold and silver became monetary commodities because of individual decisions of economic actors. This is the correct defense of a gold standard. The defense must rest on the right of individuals to own property. Gold does not have independent authority or independent sovereignty. 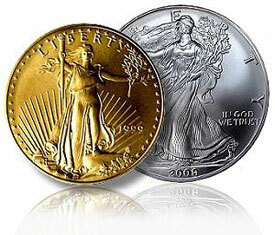 Gold and silver as monetary units are dependent on a particular legal order. This legal order ought to be favorable to the private ownership of all commodities, including gold and silver. This historically has been the position of Austrian School economics. That is because Ludwig von Mises defended his theory of the origin of money in terms of a specific logic of economics. He defended it in terms of the private property order. He did not defend it in terms of a government decree which made gold or silver a monetary commodity. He defended it in terms of the individual decisions of specific people who decided they would rather own gold or silver than some other commodity. Let us now consider the question of counterfeiting. Counterfeiting is universally condemned by civil governments. Wherever we go, a national civil government has passed a law imposing serious sanctions against anybody who would counterfeit the national monetary unit. Why governments do this? Because they are all counterfeiters, and they deeply resent an invasion of their turf. Laws against counterfeiting in today's world are a form of gang warfare. What are the economic reasons why counterfeiting of precious metals coins should be illegal? In a voluntary society, counterfeiting would be a violation of contract. It is a violation of contract because it uses fraud. The counterfeiter says that a particular coin or bar of metal contains a specific quantity and fineness of that metal. The counterfeiter has added base metals that are worth less money than the precious metal. He is trying to deceive the buyer of his coin regarding the value of the coin. Because fraud is involved, counterfeiting is a crime against the victim. Counterfeiting is a threat to society because it enables the counterfeiter to increase the supply of the monetary unit at a cost that is less than mining precious metals out of the ground. This means that there will be a greater quantity of money in circulation as a result of counterfeiting than would have been the case had counterfeiting not taken place. The problem with any increase in the money supply has to do with the disruption of prices and the communication of false information. Prices convey information. Prices distorted by counterfeiting convey distorted information. Counterfeiting decreases the value of the monetary unit generally. Almost everyone in society is hurt by the resulting price inflation. There is no equality of harm in the realm of counterfeiting. Some people win; most people lose. This is true whether the counterfeiter is a private individual acting on his own behalf, or whether he is a licensed agent of the Federal government. There are evil effects of monetary inflation. The most obvious one is the falling value of the monetary unit. Individuals who own money are harmed because the value of the money they accumulated on the assumption of continuity of value is reduced. As more monetary units come into circulation, the value of the older monetary units falls. This benefits those people who gain early access to the newly counterfeited money, which is a limited group, and it does so at the expense of people who hold the currency as a way of gaining economic continuity. Then there is the boom-bust cycle. This was described by Mises in his book, "The Theory of Money and Credit." The boom-bust cycle occurs because commercial banks increase the amount of money, which they then lend to entrepreneurs. The entrepreneurs use the newly created money to bid away capital goods and labor from their competitors. They extend the division of labor by adding new production processes. They do not do this on the basis of voluntary thrift on the part of investors. They do this on the basis that a bank has increased the money supply, and has lent this new money to them. There is an initial expansion of economic activity. Businessmen increase their demand for labor and goods, because they possess an increased supply of money by which to increase that demand. It is a question, once again, of the two fundamental points, "supply and demand," and "high bid wins." Those who get access to the new money early are in a position to bid up the price of production goods. Then, when the money supply doesn't continue to expand, the people who expanded their output of consumer goods find that consumers are unwilling to purchase the increased quantity of goods. This begins the bust phase of the cycle. Things looked promising in the boom phase, but they produce a disaster in the bust phase. Another injurious effect of inflation is that it increases the cost of making economic plans. Because rising prices disrupt continuity, producers must hedge their investments and their plans against rising costs of production. The continuity that precious metals coinage would permit is lost. It becomes more expensive to make accurate plans regarding the future. This imposes an increased cost because of the counterfeiting is going on in society. A fourth area of harm is theft of creditors. Creditors extended loans to individuals on the basis of an assumption. They assumed that the purchasing power of the monetary unit would be maintained. They may have believed that there might even be an appreciation of the currency unit, because increased productivity in society leads to reduced consumer prices. Creditors forfeited the use of their money on the basis of an assumption regarding the continuity of the money supply. This assumption is overturned when counterfeiters expand the money supply, thereby lowering the purchasing power of the monetary unit. The creditor is expropriated, because the debtor repays the loan with an asset that is worth less than it had been worth the time that the loan was made. A gold coin standard or silver coin standard provides continuity that fiat money systems do not provide. Such a standard makes life difficult for counterfeiters. This is why governments do whatever it takes to substitute a fiat currency unit for a precious metals coinage. The government wants to benefit as the nation's monopolistic counterfeiter. It will share this only with commercial banks and the central bank. It does this only because the central bank promises to be the lender of last resort to the national Treasury.